Mastodon are back with their highly anticipated seventh album EMPEROR OF SAND, another monstrous beast for their catalogue, full of the musical prowess you’d come to expect from the lads and much more. What’s instantly recognisable is that this record feels personal. I’ve read this comes from the band dealing with the news of their friends and family being diagnosed with cancer. As a result, every track feels like a labour of love. A tribute. A bookmark in time to passion and fear. Every chorus, riff, vocal delivery feels like it’s something that the band needed to pour out of their system. And that adds to the sense of grandeur that comes with their mystical storytelling here. Speaking of vocal delivery, everyone is in top form. Brann and Troy are definitely a personal highlight, having taken their delivery to new heights on some of the albums best songs like Roots Remain and Show Yourself. It’s Mastodon, so you can always bet on variation and quality and this batch has that in spades with the lads. I will say that the first half of the album is my favourite. The songs are grand, with elements across thrash, prog and sludge. Riffs are crunching, meaty, mind-melting. The songs feel huge, larger than life. After the epic Ancient Kingdom, the album kind of loses me. It’s not bad by any means, I just think the last batch of songs are…growers. They don’t have the same kind of infectious sludgy riffs as the first 6 or 7 tracks. Perhaps in time, like any album that’s a grower, I’ll get behind it and get into it but I feel a little disconnected from the back half of the album. 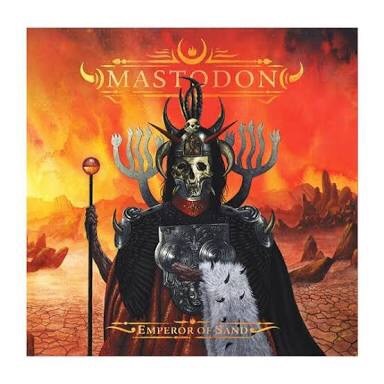 Regardless, EMPEROR OF SAND is Mastodon’s best work for me since Crack The Skye. Mastodon been consistently solid with their last two ventures, The Hunter and Once More ‘Round The Sun but Emperor of Sand feels gargantuan and like there is stakes at play. I haven’t had that feeling with a Mastodon album since Crack the Skye. So if it’s a metal album you’re looking for, do support Mastodon by checking out this. They’re always bringing something different and heavy and large to the table so you know you’re in for a journey.